Stone and another Trump associate, Michael Caputo, say they forgot about meeting with the Russian, who allegedly wanted millions for dirt on Hillary Clinton. WASHINGTON — Two longtime associates of President Donald Trump are now acknowledging a previously undisclosed contact in May 2016 with a Russian who they say offered dirt on Hillary Clinton. Roger Stone and Michael Caputo say they forgot to tell investigators about their contact with a Russian national who goes by the name Henry Greenberg — even though they say Greenberg offered to sell incriminating information to the Trump campaign for $2 million. "I flatly rejected his proposal in what was a 20-minute meeting and never mentioned it to Trump or the Trump campaign because the idea was so ludicrous," Stone told NBC News in an email. The contact was first reported by The Washington Post. He said his recollection was refreshed when Caputo mentioned it to him, after Caputo was confronted with text messages under questioning by special counsel Robert Mueller's office. Stone had texted with Caputo about the meeting, which Caputo had set up, after Greenberg approached Caputo's Russian-born business partner. "Caputo brought it to my attention, it having arisen in his interview" with Mueller's team, Stone said. Critics are wondering how such an unusual event could have slipped from their recollection, given the intense focus on Trump contacts with Russians and the allegations that the Russian government was helping the Trump campaign. "In multiple respects now, the testimony of Roger Stone appears inaccurate or deliberately misleading," said Rep. Adam Schiff of California, the ranking Democrat on the House Intelligence Committee. Stone, a veteran Republican political operative and former lobbyist for Trump, was an adviser to Trump's presidential campaign before leaving in 2015. The new disclosure brings the total of Trump associates who had contacts with Russian during the 2016 campaign to at least 12. Campaign veterans of both parties say it is unheard of for a campaign to have extensive foreign contacts, particularly with Russians. "Trump and his low travelers want Americans to believe it is common practice for foreign governments, spies and lowlifes to offer up dirt on American politicians to opposing campaigns," John Weaver, a Republican political consultant who ran John McCain’s 2008 campaign, told NBC News. "Nothing could be further from the truth. I've been involved in eight presidential campaigns. Never met a Russian or any other foreigner trying to involve themselves. And had we encountered that, the first call would have been to the FBI. After we kicked their asses out of the office." Stone's attorney sent a letter dated June 15 describing the Greenberg approach to the House intelligence committee seeking to supplement his testimony, which some Democrats have said contained falsehoods, and which the lawyer said was "entirely truthful." Stone met Greenberg in a cafe in Sunny Isles, Florida, the lawyer said. Greenberg told him he had access to "nonspecific, damaging Clinton information" that he would sell to Trump for $2 million. Stone's lawyer said Stone replied that he would never pay for political information, and Trump wouldn't either. Stone and Caputo point out that Greenberg, according to public records first disclosed by the Post, appears to have worked for years as an FBI informant. They are raising questions about whether his approach to the Trump campaign was a set-up by the FBI, something for which, at the moment, there is no evidence. 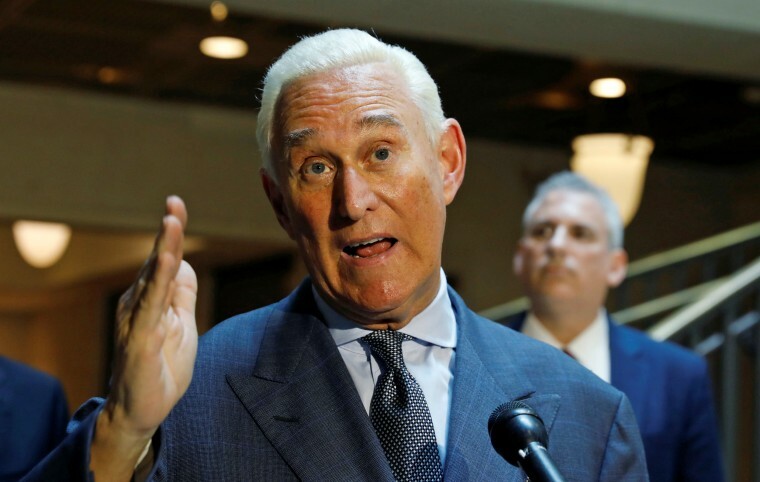 Stone also wondered to NBC News how Mueller "has copies of my text messages if not through an illegal FISA warrant," adding that he had filed a notice of his intention to sue the government "for a civil rights and right-to-privacy violation to get to the bottom of that question." The government uses a variety of methods to obtain communications pertinent to an investigation, including grand jury subpoenas, national security letters and court orders from both criminal and national security judges.